What a delight to page through Literary Chickens by Beth Moon! There is nothing literary about the chickens in the book. For some reason, Moon, an amazing photographer, thought it necessary to include literary quotes next to each chicken portrait. But the quotes have nothing to do with chickens or anything really, so I gave up reading them and just studied each chicken portrait. The portraits are in black and white, or I guess technically sepia tones. This surprised me since chickens have such colorful plumage. Moon explains she chose to remove the color because it is so often distracting. And she is right. Without the color we see more of the pattern details and look more closely at the eyes, head, bearing. The chickens are all heritage breeds, some of them rather rare. A number of them belong to Isabella Rossellini. Rossellini has a farm on Long Island where she raises heritage breed chickens. I had no idea. I already knew that chickens are originally from Asia, but I didn’t know that it was cockfighting that sent them out across the globe. In the mid-1800s chickens became popular in Britain when Queen Victoria was given some as a gift. She loved her chickens, had a fancy coop built for them, and hired them a special caretaker. I don’t know what breed these chickens were, but apparently they were enormous—nearly three times as large as the average chicken these days with giant eggs to match. Once the Queen began keeping chickens, everyone else had to get in on it too. The first ever British poultry show took place in London in 1845 and included chickens, geese, ducks, and pigeons. The first American poultry show took place in Boston in 1849. More than 1400 birds were entered. The following year an astonishing 12,000 birds were entered! But no winners were declared either year because there was no judging guidelines. Finally, in 1874, the first American Standard of Perfection was set forth by the American Poultry Association (APA). The standard is frequently updated and still used today. Strangely, the APA only recognizes 100 breeds. My Dashwoods, who are, indeed, literary chickens, are not included in Moon’s book. My girls aren’t exotic enough, I guess. I was happy to see a couple frizzles in Moon’s book. These are not a special breed but chickens of any breed that have the “curly hair” chicken gene (Google images search “Chicken frizzle breed” to see what they look like). She also includes a couple Polish breeds (Google images “chicken Polish breed”), which I adored because who wouldn’t want a chicken with a bouffant? The farm store where I got the Dashwoods began selling black Polish chickens last year and I hope to have them in my flock someday. Do take a look at Literary Chickens. If you keep chickens you will love the book. If you don’t keep chickens, you might get an idea why those of use who do love our birds so much. My Dashwoods, if you are wondering, are doing well. The weather has been warming up above freezing these last several days and the snow and ice is beginning to melt. I spent quite a lot of time Friday and Saturday chipping all the ice off the garden path. The Dashwoods can now leave their run and splash around on the cold mud-puddly path. They are thrilled. And so am I. 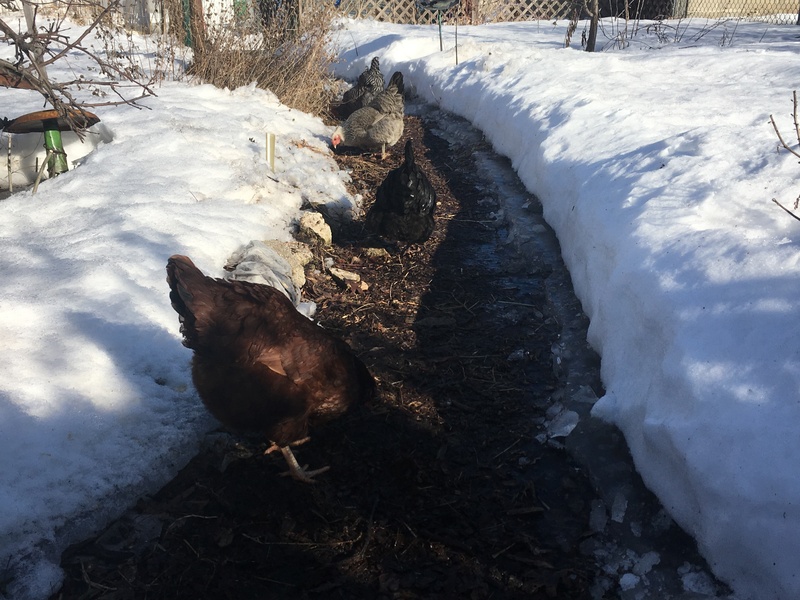 Yesterday afternoon I sat on the deck stairs in the “warm” sunshine, talking with the Dashwoods as they scratched and pecked around on the garden path at my feet. They somehow managed to find a piece of lettuce that had been frozen in the snow and was now black and limp. They fought a fierce battle over it. Each one of them managed to tear off a little bite until it got small enough for Elinor to choked down the whole of it, ending the battle. Elinor was quite pleased with herself. We are likely to get at least one more snow storm before winter is done with us. Last year we had a blizzard at the end of April. But at least it finally feels like winter will be done, that spring will not abandon us. This has lifted all our spirits, human and feathered alike. Oh my goodness, my friend keeps telling me about that documentary. We have to watch it. I love chickens and am so excited that we’re getting some this year. Over the weekend we constructed the floor of the chicken coop; walls next! I am hoping to get chicks sometime in the first two weeks of April. My dad has kept chickens his whole life and is the ‘contractor’ of this project; he has a chicken coop plan from the 1800s that he used for his coop (the one I grew up with) so we’re going with that too. Simple and functional! Chickens are so amusing. I’m so glad the Dashwoods are thriving! Spring is on the way! Heh, Daphne, you really have to see it especially since you are about to get your own chickens! How exciting that your coop is coming along. I am all for simple and functional. I can’t wait to see it completed and I can’t wait to see your babies! BookerTalk, hehe I know! Is there anything she didn’t influence in some way? Joan, then you must take a look at this book. You will love it! Oh thanks for that link. Fausnacht’s portraits are really interesting. I love the sort of wallpapery backgrounds he puts on some of them. Very cool. Oh, pshaw. The Dashwoods are all the right kinds of exotic. They most likely had other plans on the day of the photo shoot. Being busy birds, after all. What an interesting book! I had no idea Isabella Rossellini kept heritage chickens. I do not have chickens, but I might in the future (when the kids “fly the coop”… sorry, that was too easy). It’s nice to see another picture of the Dashwoods.